The Marine Weather Portal provides marine observations, forecasts and short and long-fuse warnings for the coastal waters of North Carolina, South Carolina and northern Georgia and the Atlantic and Gulf Coast areas of the Southern Region. Currently, region-specific information on marine and coastal conditions is collected by, stored and disseminated from a wide range of government and academic institutions and includes a variety of information types and protocols. This product helps meet the need for improved, coordinated delivery of relevant information to a broad user community. One of the most efficient ways for coastal ocean observing systems to disseminate marine information to the public is through a partnership with local NOAANWS Weather Forecast Offices (WFOs), since the targeted audiences already rely on these offices for marine observations and forecast needs. Check out the Marine Weather Portal. This product was developed by UNC Wilmington, Second Creek Consulting, the University of South Carolina, and the University of South Florida, in cooperation with NOAA's National Weather Service and the SECOORA. 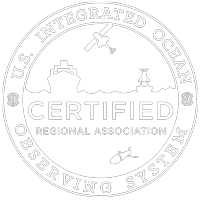 Funding for the project was provided by NOAA's Integrated Ocean Observing System.